This worldwide unique outdoor planter that serves only one purpose: To fit into your life and your living space! The easy way to grow your own vegetables, herbs, plants and succulents regardless of the size of your patio, balcony, driveway or wall and roof space. This upcycled planter from Growbag is made out of old billboard material. Once the advertising campaign is over the material gets a new life and is transformed into a functional upcycled gardening planter range. Enhance an existing garden or create an urban garden with this unique and funky upcycled hanging planter from Growbag! With the sale of each Growbag a percentage of the price will go towards the production of these gardening containers which will then be donated to the participants of the Soil For Life program. Read more about the community project here. –> CLICK ON THE PRODUCT IMAGE OR NAME FOR MORE INFORMATION ABOUT THE PRODUCT AND THE PROJECT. Contact us for more details on availability of colours in a specific size. This upcycled planter from Growbag is made out of old billboard advertising material. 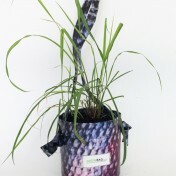 The PVC vinyl material is highly durable and makes this upcycled planter range incredibly long lasting. Enhance an existing garden or create an urban garden with this unique and funky upcycled hanging planter from Growbag! You can make your container planting a successful urban garden with these upcycled planters from Growbag. Here is how: Pick your favourite colour and size that fits into your living space. Plant a seedling or seed into the container, make sure you follow planting instructions for the specific plant. Water and give it plant food regularly. Enjoy growing your own veggies, herbs, succulents and blooming flowers! 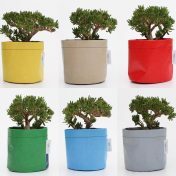 COLOUR OPTIONS: We can make planters in any colour, therefore email us your favourite 3 colour combinations for your upcycled planter after you’ve purchased the item. We will get back to you with the available option. The production time is between 1-2 weeks depending on order volume. * These planters have the same measurements as the hanging planter Size S, however these doesn’t have a hanging strap. * Planters sold without plants – this are only props. * These planters have the same measurements as the hanging planter Size M, however these doesn’t have a hanging strap. This upcycled hanging planter from Growbag is made out of old billboard material. Once the advertising campaign is over the material gets a new life and is transformed into a functional upcycled gardening planter range. Browse through a variety of sizes and colours or email us your specific size/colour request. Enhance an existing garden or create an urban garden with this unique and funky upcycled hanging planter from Growbag! 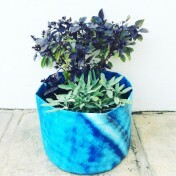 The PVC vinyl material is highly durable and makes this upcycled planter range incredibly long lasting. Each hanging planter is handmade in Cape Town by skilled producers who pride themselves with quality work and ethics. With this project Growbag is empowering their staff and creating jobs. With the sale of each Growbag a percentage of the price will go towards the production of these gardening containers which will then be donated to the participants of the Soil For Life programme. Read more about the community project here. 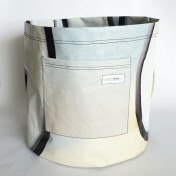 COLOUR OPTIONS: Indicate the colour of the upcycled hanging planter bag you would like to purchase. If planters are not available in your preferred colour email us your request! We’re regularly updating new colour options. Specific colour combinations are dependent on the vinyl availability, however may be requested. The production time is between 1-2 weeks depending on order volume. Everyone can have a green thumb! You can make your container planting a success with these upcycled hanging planters from Growbag. Here is how: Pick your favourite colour and size that fits into your living space. Plant a seedling or seed into the container, make sure you follow planting instructions for the specific plant. Water and give it plant food regularly. Enjoy growing your own veggies, herbs, succulents and blooming flowers! PLEASE NOTE: As this is a recycled outdoor material which was exposed to the weather it may show little imperfections. This however does not change the functionality of the product, but simply gives the item its unique character. Enhance an existing garden or create an urban garden with this unique and funky upcycled hanging painter from Growbag! With the sale of each Growbag a percentage of the price will go towards the production of planting containers which will then be donated to the participants of the Soil For Life programme. Read more about the community project here. These unique upcycled wall garden planter by Growbag have been created for people with limited ground space. If you are looking to grow your own herbs, flowers, succulents etc. and enhance boring wall space with an urban garden this is the best product for you! 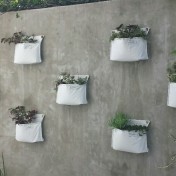 This range of wall garden planters is made out of old billboard material and are incredibly long lasting. Once the advertising campaign is over the material gets a new life and is transformed into a functional upcycled gardening planter range. Browse through a variety of sizes and colours in the Bonsela online store. 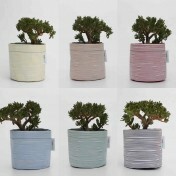 The PVC vinyl material is highly durable and makes this upcycled planter range incredibly long lasting. Each wall garden planter is handmade in Cape Town by skilled producers who pride themselves with quality work and ethics. With this project Growbag is empowering their staff and creating jobs. COLOUR OPTIONS: This wall garden planter range comes in white. If you wish to order the upcycled wall planter in a your preferred colour please email us your request! Specific colour combinations are dependent on the vinyl availability, however may be requested. The production time is between 1-2 weeks depending on order volume. Everyone can have a green thumb! You can make your container planting a success with this upcycled wall garden planter from Growbag. Here is how: Pick your favourite colour and size that fits into your living space. Plant a seedling or seed into the pocket, make sure you follow planting instructions for the specific plant. Water and give it plant food regularly. Enjoy growing your own veggies, herbs, succulents and blooming flowers! 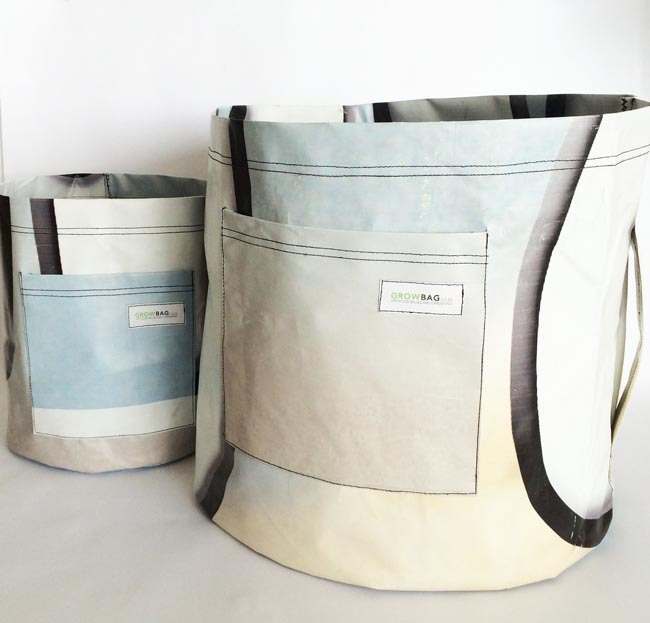 —> SALE price for a set of 3 Wall Pockets is R 375 instead of R 450!! Limited offer for online purchases until end of November! 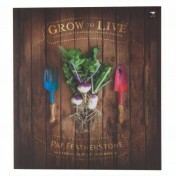 This book by Pam Featherstone from Soil For Life is the best inspiration one needs in order to start the own garden. You will learn all the basics and tricks on to growing own food and successfully creating the most beautiful garden! 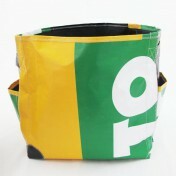 This Growbag planter is part of a limited edition range thats made out of printed PVC and old billboard material. Its only available in sizes S and M in 6 colours of this hand-drawn stripy design pattern, which can be reordered/reprinted. Once the advertising campaign is over the material gets a new life and is transformed into a functional upcycled gardening planter range. Browse through a variety of sizes and colours or email us your specific size/colour request. –> This planter has the same measurements as the hanging planter Size S, however this one doesn’t have a hanging strap. 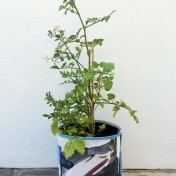 The PVC vinyl material is highly durable and makes this upcycled planter range incredibly long lasting. Each planter is handmade in Cape Town by skilled producers who pride themselves with quality work and ethics. With this project Growbag is empowering their staff and creating jobs. With the sale of each Growbag a percentage of the price will go towards the production of these gardening containers which will then be donated to the participants of the Soil For Life program. Read more about the community project here. Everyone can have a green thumb! You can make your container planting a success with these upcycled planters from Growbag. Here is how: Pick your favourite colour and size that fits into your living space. Plant a seedling or seed into the container, make sure you follow planting instructions for the specific plant. Water and give it plant food regularly. Enjoy growing your own veggies, herbs, succulents and blooming flowers! –> This planter has the same measurements as the hanging planter Size M, however this one doesn’t have a hanging strap. This upcycled planting container from Growbag is made out of old billboard material. Once the advertising campaign is over the material gets a new life and is transformed into a functional upcycled gardening planter range. Browse through a variety of sizes and colours or email us your specific size/colour request. Enhance an existing garden or create an urban garden with this unique and funky upcycled painting container from Growbag! With the sale of each Growbag a percentage of the price will go towards the production of these planting containers which will then be donated to the participants of the Soil For Life programme. Read more about the community project here. 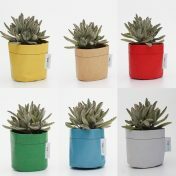 COLOUR OPTIONS: We can make planters in any colour, therefore email us your favourite 3 colour combinations for your upcycled planting container after you’ve purchased the item. We will get back to you with the available option. The production time is between 1-2 weeks depending on order volume. 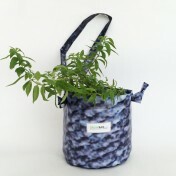 Enhance an existing garden or create an urban garden with this unique and funky upcycled painter from Growbag! With the sale of each Growbag a percentage of the price will go towards the production of these upcycled planting containers which will then be donated to the participants of the Soil For Life programme. Read more about the community support project here. COLOUR OPTIONS: We can make planters in any colour, therefore email us your favourite 3 colour combinations for your upcycled planter bag after you’ve purchased the item. We will get back to you with the available option. The production time is between 1-2 weeks depending on order volume. Enhance an existing garden or create an urban garden with these unique and funky upcycled planting containers from Growbag! With the sale of each GROWbag a percentage of the price will go towards the production of planting containers which will then be donated to the participants of the Soil For Life programme. 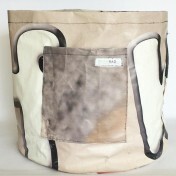 PLEASE NOTE: As this is a recycled outdoor material which was exposed to the weather it may show little imperfections, which do not change the functionality of the product, but simply give the item its unique character. COLOUR OPTIONS: Indicate the colour of planter you would like after purchase – if planters are not available in your preferred colour email us your request! We’re regularly updating new colour options. Specific colour combinations are dependent on the vinyl availability, however may be requested. The production time is between 2-4 weeks depending on order volume. 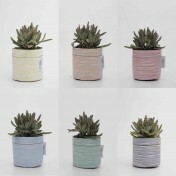 Everyone can have a green thumb with these upcycled planting containers from Growbag. Enjoy growing your own veggies, herbs and blooming flowers! PLEASE NOTE: This colour combination is sold. 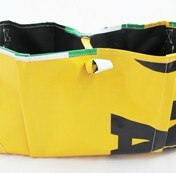 Each Growbag planter is unique in colour, therefore please contact us for updates on colour availability. With the sale of each Growbag a percentage of the price will go towards the production of the L/XL size planters which will then be donated to the participants of the Soil For Life programme. Production time for the planters is 2 weeks, depending on the order volume. Specific colour combinations are dependent on the vinyl availability, may be requested.